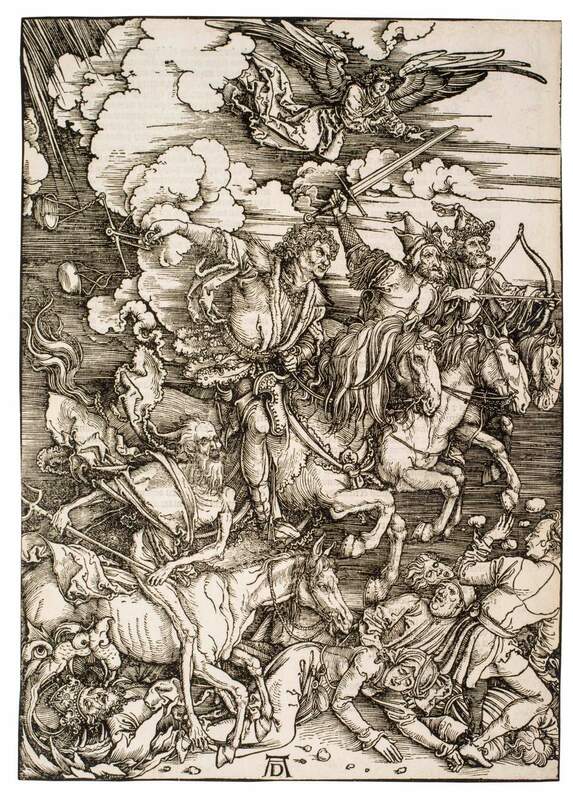 The publication of the Apocalypse was a revelation of Dürer’s artistic genius: never before had a single artist executed a project of such scope with total mastery of every aspect. With his work, Dürer was to transform the appearance of the illustrated printed book. His large, complex images, full of life and movement and set in realistic settings, feature a descriptive power evident in the present series. Revolutionary in its time in both technique and breadth of concept, his woodcut style graphically manifests the potency of St. John’s visions, capturing minute detail, rich texture, profound physical vigor, and mastery of light and darkness. In 1498 Dürer published both a Latin and German edition comprising a title page and fifteen full-sheet woodcuts, with text printed on the versos of all the cuts except the last. In 1511, Dürer reprinted the Apocalypse in Latin and issued it with the Large Passion and the Life of the Virgin. In his Netherlandish diary, Dürer referred to the sets collectively as ‘The Three Large Books’. With editions in Latin and German, the book became accessible to the widest possible audience. Today, however, it is rarely seen in commerce.